In 1967 the Australian and New Zealand governments jointly agreed to issue an ANZAC Commemorative Medallion to all surviving veterans who had served on the Gallipoli Peninsula, or in direct support of the operations from close off shore, at any time during the period from the first ANZAC Day in April 1915 to the date of final evacuation in January 1916 or to next of kin of veterans. The ANZAC Commemorative Medallion was was not designed to be worn. This medal was issued to all those who had already qualified for the 1914 or 1914-15 Stars, and to most persons who had already qualified for the British War Medal. The Victory Medal is distinguished by its unique ‘double rainbow' ribbon. 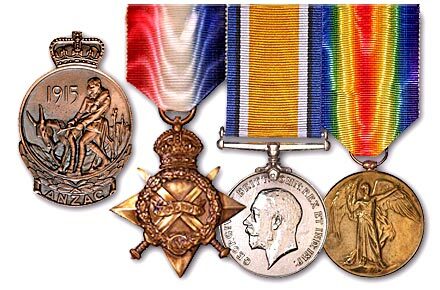 Approximately 6 million of these medals were issued to military personnel from the British Empire. This medal is sometimes referred to as the "Allied War Medal", because the same basic design and the double rainbow ribbon were adopted by 13 other Allied nations (though the United States of America alone issued their medal with campaign clasps). The Union of South Africa produced a version of the medal with a reverse text in English and Dutch (not Afrikaans, as is often stated). No clasps or bars were issued for The Victory Medal.